Henry’s diaversary comes the day after my birthday. His diaversary always makes me feel a bit glum, because it’s easy to imagine what life was like before diabetes: just eating without counting carbs or dosing insulin, sleeping through the night, or worrying about long term side effects. But if I’m being honest, that life—life without diabetes—is sliding further into my memory each season. It’s Henry’s third diaversary, and it’s the first diaversary that marks the fact he’s lived longer with diabetes than without it. Yet, he doesn’t need a date on a calendar to tell him that. Recently at a restaurant, the pre-bolus of insulin started working dramatically on Henry’s blood sugar before the food arrived. I couldn’t reach him to check his blood glucose, so Henry reached into his d-bag and got out his meter. So diaversaries are about the big moments, like marking another year of living with diabetes, but really, diaversaries are about the thousands and thousands of small moments—going without, waiting, measuring, but also unexpected sweetness, like eating jelly out of the packet while you wait for your food to arrive. So here’s to another year of the highs and lows, too much, too little, and resting in the spots inbetween. A few times a week I find myself in a conversation or action that illustrates how different my son’s childhood is from his sister’s and classmates’— my own childhood. On one hand, I attempt to manage diabetes, but with the other, I try to orchestrate a “normal” childhood for Henry. We’ve never made any food or activity off-limits for him, but instead try a little bit of most things. The weather is still warm enough to walk to and from school, and easily my favorite part of the day is being greeted by Henry after his day at Kindergarten. He usually has some very important fact to tell me, such as, 16 is an even number. The day the local firemen came, Henry bounded out of the classroom door yelling, “How old are our smoke detectors? Did you know you can only use a smoke detector for 8-10 years? If you take it off, there’s a date on the back. Can we go home and see the date on the back?” (For the record, I did not know this). Our small town is so adorable that I jokingly say we live in Stars Hallow. It was a gorgeous fall afternoon, the maple trees orange blazes against a blue sky, leaves crunching underneath our steps, but we weren’t talking about any of that. Instead, Henry seemed almost worried, checking in to make sure everything was fine. Of course he knows. He knows beyond knowing. We live in a small Midwestern town, where it’s a winter’s winter about five months out of the year. In deep winter, the temperature (not the windchill, the actual temperature) can reach -24 Fahrenheit. In mid-March, just when the snow, salt, and ice threaten to become a forever feature, there’s a little less gray and the icicles drip away. In the next month, the snow melts, tulips emerge, and the town’s most popular ice cream joint opens for the season. There’s always a line of people and taillights, celebrating a baseball game or summer evening. Having type 1 diabetes does not prohibit what people can eat. People with T1D can eat anything; however, many people choose to limit or eliminate certain foods simply because it makes blood sugars potentially easier to manage. Right now, we don’t eliminate food, but eat a little bit everything in moderation. When we get an ice cream, it’s a celebration. Recently, we’ve discovered the power of pre-bolusing and are starting to practice some of Dr. Ponder’s Sugar Surfing advice. It can be nerve-racking to pre-bolus a large amount of insulin for a restaurant meal or special treat, particularly when there’s little control over when the carbs will arrive. Matt is a lot better about waiting out the downward slide than me. I nervously check and recheck the CGM. But then the sugar starts to kick in— the rise is more gradual and less extreme. The insulin action time better matches the carbs. We’ve figured out if we give enough insulin to cover for 30 carbs that by the time we’re through the line, with a strawberry ice cream baby cone in hand, that his blood sugar usually evens out to about 145 half an hour later. I’ll take a rolling line after ice cream any summer night. “Social Media for the Social Good,” that’s how Kerri Sparling described the project, Spare a Rose Save a Child, on Stacey Simm’s February 2nd podcast, Diabetes Connections. The idea behind Spare a Rose Save a Child is simple: buy one less rose than you would have on Valentine’s Day and donate its cost. By donating $5, the cost of one rose, a child is supplied with insulin for a month. Living with a chronic condition means you have to secure your oxygen mask first, but when cabin pressure is restored, there’s an awe-filled moment when you can gaze out the window at the top of clouds and be amazed that you’re in about the fourth generation of humans who’ve lived on this earth, to fly in the air, and about the third to be alive since insulin’s been discovered. It doesn’t take long to recognize that access to life-sustaining medicine shouldn’t be relegated to where you were born. As we were being discharged after our son’s diagnosis, a hospital pharmacist sheepishly walked into our room. He was carrying a large brown paper bag, and at first I thought it was odd that he was holding groceries. I thought maybe he was on his way home to prepare dinner and just wanted to check-in with the doctor, who was going over discharge orders with us. It turns out the sack held a month’s supply of syringes, lancets, ketone test strips, alcohol pads, and two kinds of insulin. As a way of apology, he said this was one of the worst parts of his job, entering the room of a young child who had just been diagnosed with a lifelong disease and letting the family know that they’d be billed around $500 for the month’s supply of medicine and medical equipment the hospital was sending home. He then noted that we had good insurance and would be paying less than that. And we do have good insurance. In fact, we have access to everything (medical equipment, doctors, education, medicine) that we could possibly need to take care of our son’s diabetes, but this isn’t true for the underinsured, those without insurance, and those living in developing countries. Diabetes is hard, and we have everything we need. Diabetes is hard, and it’s unthinkable for those who don’t have what they need. This Valentine’s Day instead of buying chocolate and flowers, we’re buying insulin for someone. What’s sweeter than that? A few weeks after starting Kindergarten, I noticed a blue ring around my non T1D daughter’s mouth. When I asked her about it, she quipped, “Brain’s birthday,” which I later found out meant that with 24 kids in class over 36 weeks of school means a birthday celebration every two weeks. Plus holiday parties. 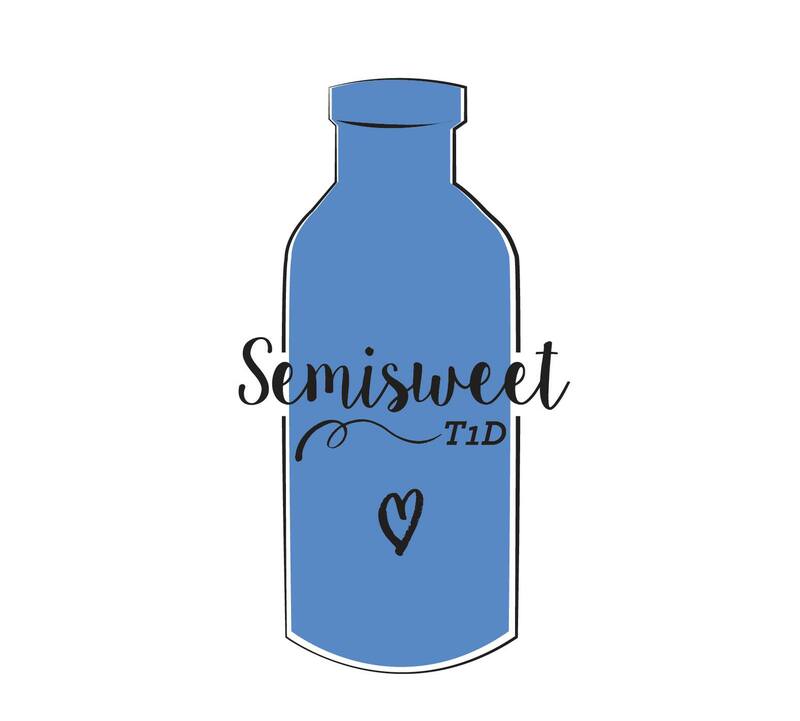 Even before type 1 diabetes entered our family, we’d reserved sweet treats for special occasions. If a child asks for something like a grocery store cupcake, we generally respond with, “It’s probably not a good idea for anyone to eat that.” Sure, a grocery store cup cake once in a while is fine, but treats like this seem to have permeated childhood. I think most parents aren’t thrilled about the idea of their kids eating this kind of food. Now imagine your child has type 1 diabetes. Generally, this scenario can go two ways. The child with diabetes is told he or she can’t have the treat by a parent volunteer or teacher, so then the kid gets to eat nothing (or sugar-free Jell-O) while watching his or her classmates enjoy deli cupcakes or cookies. In the second scenario, the child gets to eat the treat, because children with type 1 can eat anything, but it’s just impossible to get synthetic insulin to match the metabolic challenge that is a partially hydrogenated, shelf-stable, steroid level sugared, red dye #3 filled deli cupcake. So the kid with type 1 eats the cupcake, and has an elevated blood sugar for several hours, which is difficult to bring down, and during this elevated blood sugar, the kid feels foggy, tired, achey, thirsty, and upset. So, what’s the right choice? There isn’t one. As parents, we’ve fallen on both sides of the sugar divide. We’ve let our son eat cupcakes at birthday parties and battled 300-400 blood sugars into the night that don’t seem to budge no matter how much insulin we pour on it. In other instances, we’ve brought our own low carb “treat,” avoided events, or distracted him. Moments like this reveal that diabetes is often a choice between bad and worse. As we enter another season of sweets, we’ll fall on both sides of the sugar divide, and recognize that when a parent has to choose between bad and worse, it’s a pretty lousy feeling. This week we were at a birthday party, for which we’d planned all day. We knew the carb counts of what would be at the party. We’d purposefully kept our son’s carb intake light in preparation for the party. We had a rockin’ prebolus and temporary increased basal. At the dessert buffet, we let Henry choose anything he wanted to eat, and he ate gold fish, clementines, a cupcake, pretzels in a pool of white chocolate, peanuts covered in chocolate, and pop corn. He selected almost everything except for this cookie, but he kept circling back to it during the party. “Yeah,” he said, and he just stood there a long time. A long time. Not taking one. Not asking for one. Just looking. “What do you think they taste like?” he asked. As these words were coming out of my mouth, I knew they were simultaneously the easy and worse choice. We never tell Henry that he can’t eat something because he has type 1 diabetes, but in a way, I just did. He walked away from the table and played soccer with a balloon as we helped clean up for the next hour. We headed over to our hosts’ house, where all the cookies and party treats followed. We ordered Chinese food for dinner, and learning from our previous Chinese food experience two weeks ago, we went bold with insulin and ran a combo bolus coupled with an increased basal. About 45 minutes after dinner, Henry’s blood glucose was 70 with 1.39 units of insulin on board. “Yeeeeeesssss,” he shouted, and ran to the kitchen. He came back with the cookie accomplished, and while dusting the crumbs from his thumbs on his shirt, he said, “Hey mama, those cookies don’t taste sour.” He said it with this kind of crazy half-smile that told me he was dubious about sour cookies from the get-go. Smart kid. Having type 1 diabetes means following a pattern of exact measurements and calculations, all the while knowing that a pattern or desired result could likely not be the outcome. One day, Henry can run around like a madman at the playground and then come home to compete is some serious sofa jumping, and sometimes this physical activity will cause him to have a low blood sugar, but other times his blood sugar can go up. However, there is a constant calculation in type 1, a perfect diabetes storm: food, stress, and biology, otherwise known as breakfast. Common breakfast foods such as sugary cereals, pancakes, waffles, and bagels are refined carbs that jack up blood sugars. 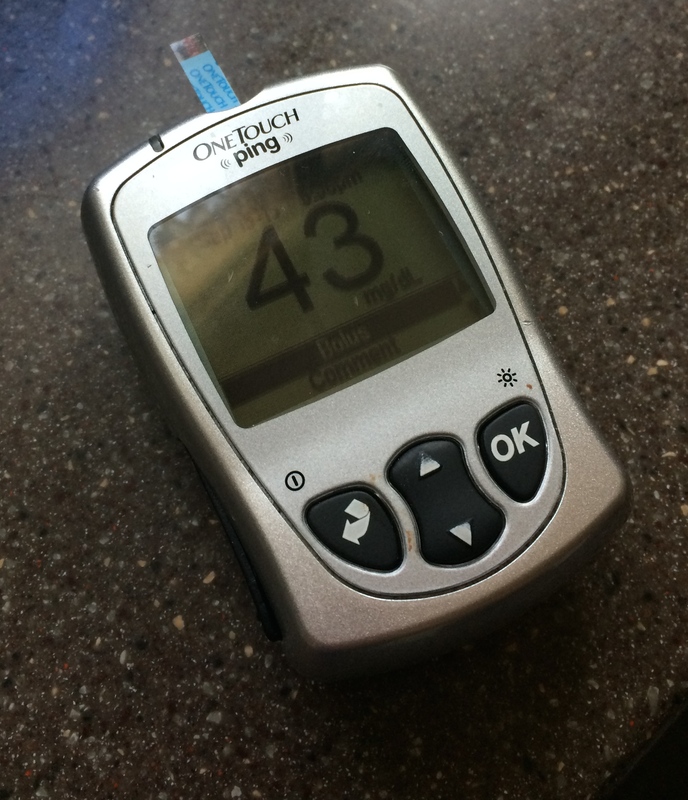 The quickest way to see two arrows up (which indicates a rapidly rising blood glucose) on a CGM is to eat these common, simple carb-rich breakfasts foods. I’m always confused by those scenes on T.V. shows and movies where families sit down in work clothes to pitchers of orange juice, bacon, and omelets before work and school. Really? Does this really happen? Really? A montage of a morning scenes at my house involves waking up two young kids, brushing hair and eating at the same time, putting at least one article of clothing on backwards, forgetting something, the kids playing a last minute game of school with stuffed animals just minutes before they go to their actual school. And diabetes care. Breakfast is literally breaking a fast. When we go a long time without food, our body makes its own energy through glucoseneogensis, which is exactly what the word sounds like: the creation of new glucose, which is done from glycogen stores in the liver. In someone without T1D the beta cells of the pancreas send a message to the alpha cells of the pancreas to start the process of glucoseneogensis, which prevents our blood sugar from dropping too low, or around 70, in long time periods without food, like overnight or interminable work meetings. In someone with T1D, the beta cells are non-functioning and therefore can’t communicate with the alpha cells. So the result of this is sporadic and unreliable glucoseneogensis. If endogenous (originating inside the body) glucose is being circulated, it takes exogenous (coming from outside the body) insulin to bring a blood glucose back in range. People with T1D are taught to account for exogenous glucose (glucose coming from food), but endogenous glucose is a crapshoot. I don’t have type 1, and I’ve worn my son’s continuos glucose monitor on occasion. In the picture below, you can see a CGM on the top, which is my son’s. He woke up with a high blood glucose just below 200, and experienced a quick rise from the carbs he ate for breakfast. I woke with a blood sugar around 80, and it rose after I got up, cooked, and got the kids ready. The arrow points to where my blood sugar rose because of glucoseneogensis, but my endogenous insulin production quickly brought my level back down. The rising line on my son’s CGM shows just how difficult it is to get biology and math to line up. Here’s one of the great challenges of diabetes care: a person caring for type 1 diabetes has to make decisions that simultaneously require anticipation and reaction. Every morning, we have to react to the waking glucose value and anticipate the food, activity, emotion, and invisible metabolic processes that Henry will encounter during his day. It’s taken a while, but here’s how we’re navigating the perfect storm of diabetes and breakfast. Now that we’re paying attention to food, it’s really obvious that everyone should not eat some things. On occasion, I’ve worn my son’s CGM, and I can watch my non T1D blood sugar rise after eating a few crackers or a bit of bread. When I eat a salad or lean protein, there’s no rise in the line that indicates my blood sugar. It’s an easy conclusion: some foods, usually shelf-stable refined carbs, should not regularly be eaten. For breakfast we try to balance our son’s plate with a fat, a protein, and carb. A typical breakfast for him might be something like an egg sandwich (check out this low carb bread) with cheese and an apple, or a wholegrain waffle with sugar-free syrup, sausage, and an egg. I got nothing here. Diabetes makes everything harder. In related news, (see above) we’ve opened a casual breakfast diner at our place. Diabetes brings consistent inconsistencies. This morning Henry’s waking blood sugar was 94. Yesterday, it was 186. His blood sugar will be inconsistent, but we can consistently pre-bolus. Lately, while our son is still waking up, often in bed, or as part of getting dressed, we pre-bolus his insulin for breakfast. As his body goes through the metabolic process of waking up, and we complete the morning tasks of getting ready, this is a great time to pre-bolus and let the insulin’s onset of action time line up better with the carbs he’ll be eating in about 15-20 minutes. With all this science, research, and effort, here’s yesterday’s two-hour post breakfast data. Looks like we’ll be pre-bolusing and serving up eggs over easy at Casa Del Semisweet from now on. Announcing our first GIVE AWAY! You’re invited to comment and with a recipe, link, or breakfast idea that’s blood sugar friendly. I’ll leave a few ideas and links in the comments to some breakfast foods we’ve been trying. If you post your comment by December 31st, a winner, at random, will be selected to receive a bar of handmade Semisweet Soap. I’ll contact the winner for shipping information, and we only ship within the U.S.
I’ve always read nutrition facts, but now I analyze nutrition facts because I have to depend on the the carbohydrates to determine how much of a life sustaining (or ending) drug, insulin, to give my kid. The first trip to the grocery store after our three-year-old son was diagnosed with type 1 diabetes was shocking. Our local grocery store has a nutritionist, and shortly after explaining why I was looking for certain products he said, “A grocery store’s a bad place to be if you’re diabetic.” He wasn’t saying anything I hadn’t already felt, but where else do you get food in March in the midwest? I was at the grocery store for three hours, reading the nutrition labels for every food we typically eat. Freezing, I stood at the dairy case shaking my head at the yogurts, not because Henry couldn’t eat yogurt (he can), but because of all the added sugar in most every food we eat. We’ve always been a family that cooks from whole ingredients, belongs to a CSA, and frequents farmer’s markets. However, we still have snack foods and sweets in our house. We’re pretty moderate— a little bit of most things, but having type 1 diabetes at our table has made our intentional choices even more intentional. Reading nutrition labels and portioning food is a good reminder of just what and how much we should be eating. I came across Eve O. Schaub’s memoir, Year of No Sugar. For one year, Schaub and her family of four ate only food with no added sugar. As they embarked on this year, the family had to discuss what the ground rules were and what defines no “added sugar.” Schaub was inspired to start the project after watching the amazing lecture, “Sugar: The Bitter Truth,” by Dr. Robert Lustig, a Professor of Pediatrics, Division of Endocrinology at UCSF. In case you don’t watch the 90 minute lecture, here’s the take away. Since the 1950s Americans are about 20 pounds heavier. We eat more sugar and carbs than we use to, and here’s the science part (45:00 into the video): fructose is metabolized in our liver in a way that’s similar to alcohol. Dr. Lusting says chronic fructose exposure results in metabolic syndrome: obesity, lipid imbalance, and type 2 diabetes. I know type 1 diabetes and type 2 diabetes are two separate diseases, with two separate etiologies. Type 1 is an autoimmune disease and type 2 is a disease associated with the interaction of genes and lifestyle. Since our son lives with type 1, we’ve become more aware of just how much sugar is in everything we eat. Constantly reading nutrition labels is a reminder of just what we should and shouldn’t be eating. Focusing on carbs and sugars has also shown us that sugar is ubiquitous, so maybe it’s time to change the conversation around type 2 diabetes from one of shame and blame to one of regulation and education when it comes to the food supply in America.